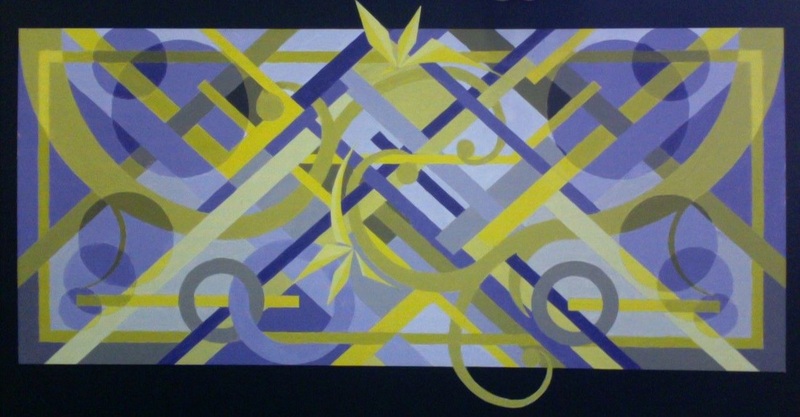 The Yellow/Violet Project, also from Color and Design class, features yellow and violet as dominant colors, supported by any colors mixable from those two colors, plus white. The design must be laid out as a root five rectangle. This is a square with a golden rectangle on either side. The golden rectangles must be bilaterally symmetrical, while the center square is required to be asymmetrical. In this way we hope to see dynamic symmetry. Students must draw with only compass and straight edge, and may not use any freehand elements. All designs are 8 x 18 inches, acrylic on canvas paper.